I just acquired a new storage product for some of my cards in the Herschel Hoard. Below is a top loader binder, sold by Colin and Christiane Mercer, out of NW Card Supplies in McCleary, Wash. The nice thing about this binder is that it does as the name says, that is, you store the entire toploader, with the card inserted, into the binder pages. The pages have little tabs on the corners, which help keep the toploaders in place once they are inserted. As you can see, there is space for six cards per page. When you buy the binder, you get 30 pages included, so that's room for 180 cards. I decided to get one for my Herschel autographed cards, and memorabilia patch cards. 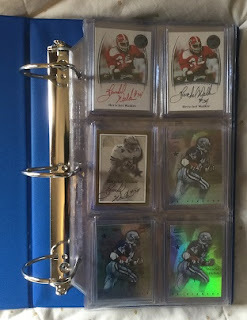 This binder is extremely well made. The cover is padded, and the pages are heavy duty, as one would presume, to hold the weight of the toploaders and cards. As can be seen, the D ring mount is on the back page, rather than on the spine, which makes for a much stronger hold, and keeps the spine from excessive strain. The binder is 12" high, by 10" wide by 4" deep. It comes in blue or black. Do keep in mind that regular 3 ring pages will not fit in this binder, as the rings are sized differently. Here is one more picture, showing the card backs as well. I am very pleased with this product. 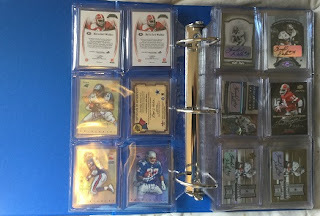 The company website, www.toploaderbinder.com, states that the binder holds up to 100 point toploaders, but I got a couple in that I know were thicker. If you have a really thick card, I wouldn't force it, but I was surprised how well it worked for some of my thicker cards. In closing, I give this binder 5 of 5 stars. They are not cheap, but you get what you pay for. The shipping costs are pretty high, but I'm sure that's due to the weight of the product. 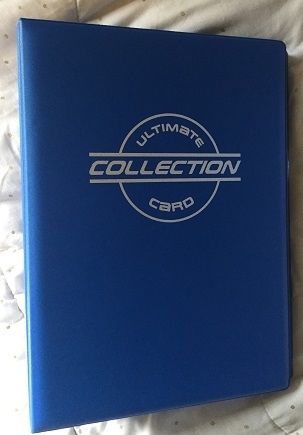 I like having my cards in a binder for easy viewing, but protected as well, and this product allows me to have my cake and eat it too! Binders look great. Thanks for the great review as well. I think I am going to have to invest in one myself.